As an attorney, what do you do when you have a client that you know has lasting damage and pain, but has received a negative IME or their pain doesn't show even with advanced imaging? Normal range of motion assessments only show how far the muscles are able to extend and often appear normal, even though a patient is still experiencing pain. When traditional measures fail you, bringing a client in for a DynaRom assessment can definitively document muscle guarding as the result of soft tissue injury. When fighting for continued care for your client or settling a case, having the results of a DynaRom assessment can be a powerful tool. Lack of objective evidence often brings a low verdict for personal injury cases. The DynaRom tool is backed by over 9,000 published research studies and an impeccable record of court victories. In the words of plaintiff attorney Mike Maxwell, "Plaintiff cases often end up resting on patient testimony [...], which is a weak, weak case." However, he went on to say, "When a plaintiff attorney brings in Dynarom, its objective findings cannot be denied." Simply put, muscle guarding proves pain. DynaRom objectively reports muscle guarding. Patients and attorneys alike are relieved to see the damage simply and scientifically presented. In the words of American Medical Association author Dr. John J. Gerhardt, MD, "Its integrated use of sEMG and true wireless dual range of motion is brilliant. Surface EMG effectively augments ROM by assessing effort." 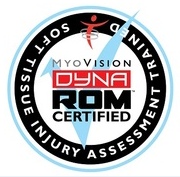 Dr. Kelly Chowjdak, D.C., is a certified through MyoVision to assess soft tissue injury. After she performs the scans, she will evaluate them and create a report of findings to aid your case.